NOTE: Please note that all the above sizes are in millimetres (mm), Inset sizes are opening requirements. NOTE: This electric product requires a 13amp socket to plug into on installation, and the heat is provided by a fan heater under the fire as shown in the picture above. ² This is Dimplex Low Energy Bulb lifespan is according to 2007 research assuming fires running for 5 hours a day 7days per week. This product can easily be installed by a qualified Electrician or competent Builder or Trades person. It is recommended that this fire should not be used as a sole source of heat rather as a secondary source in conjunction with central heating. 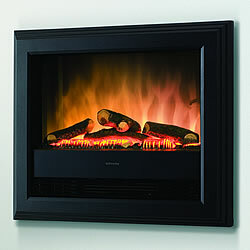 The delivery service offered on the Dimplex SP16 is based on a one man, kerbside, only delivery. Due to the nature of this product, you will need to arrange additional assistance to offload the goods from the vehicle when it arrives at your delivery address. The Dimplex SP16 is delivered on a pallet normally by a vehicle in excess of 7.5 tonnes or more so please ensure to advise us in writing by email if your property has any difficulties with access so alternative arrangements can be made to avoid incurring additional costs in the event a delivery cannot be made if the vehicle cannot deliver safely to your location. All information contained in the website is to assist in your choice of a suitable fire. This is not intended to be all the information required to install your fire. This can be obtained from Dimplex themselves.